Since a few years, I wanted to do a trip in the Western Palearctic (WP sensu BWP) part of Mauritania in search of the birding specialties that can be found here (cf Crochet 2007, Crochet & Haas 2013). 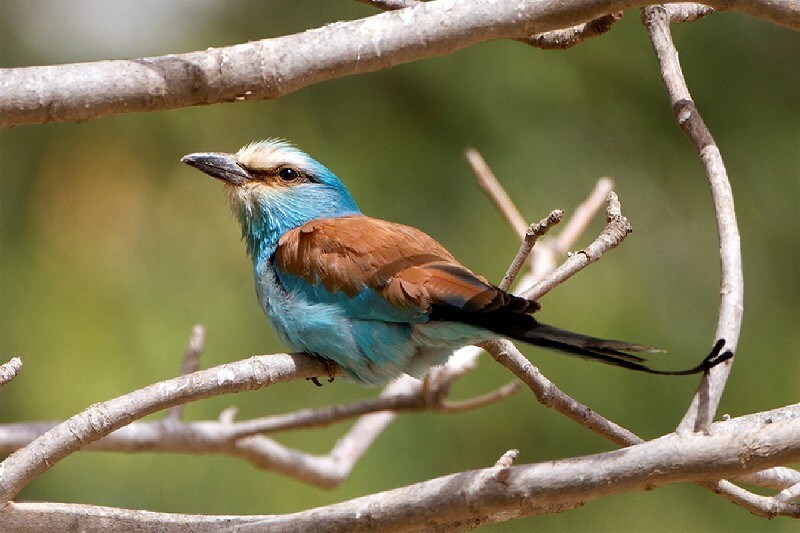 The presence of a long-staying Abyssinian Roller Coracias abyssinicus at Nouadhibou from autumn 2017 into spring 2018 (Haas & Ławicki 2018) created the motivation for such a journey. The WP part of Mauritania is situated north of the parallel 21°N but also includes the National Park of ‘Banc d’Arguin’ (not including the continental area) and the eastern part of the Nouadhibou peninsula, the western part belonging to Western Sahara. Mauritania has the reputation of being unsafe among a lot of Europeans, because of terrorist activities in the past. At the moment, the problem is solved despite the proximity of Mali and Polisario’s territory (between Western Sahara, Morocco, and the north of Mauritania). During my trip on 19-30 March 2018, I encountered no safety problems. The most desirable (sub)species for birders working on their WP list in northern Mauritania are Golden Nightjar Caprimulgus eximius, Mauritanian Heron Ardea monicae, White-breasted Cormorant Phalacrocorax carbo lucidus, Reed Cormorant P africanus, Grey-headed Gull Chroicocephalus cirrocephalus, African Royal Tern Sterna albididorsalis, African Grey Woodpecker Dendropicos goertae, Blue-naped Mousebird Urocolius macrourus, African Dunn’s Lark Eremalauda dunni dunni, Cricket Warbler Spiloptila clamans and Sudan Golden Sparrow Passer luteus. Several large airports in Europe have flights to the capital of Mauritania, Nouakchott; eg, from Paris, a good option is with Royal Air Maroc via Casablanca (€ 585 for return fare on my dates). On arrival, you must take a visa (€ 55; passport must be valid for at least six months and all hotels booked for the trip must be indicated). The formalities consist of completing a form, taking fingerprints and a facial photograph. The best is to use a travel agency that handles hotel bookings and provides chauffeur-driven vehicles for transportation. For the visa, when using an agency, it is sufficient to indicate the name and telephone number of the agency. It is also possible to go directly to Nouadhibou with Mauritania Airlines from Casablanca (that can be reached from all European international airports) and get the visa there but this is not guaranteed. It is essential to contact a travel agency which provides a reliable driver and a good vehicle able to lead you safe in sand dunes and sandy deserts and on stony and sandy tracks. Tracks are sometimes extremely difficult to follow because the sand and wind erase the tracks. A driver who can find his way in all circumstances with a perfect knowledge of the country is essential; he must be able to always find his way and know what to do in the event of a breakdown in a very isolated environment. The connection with smartphone is not always realized. The vehicle used during my trip was a Toyota pick-up, not very modern but this is an advantage because new vehicles full of electronics are very sensitive to sandy and dusty circumstances and more easily out of order. When traveling, police and gendarmerie checks are frequent; it is necessary to provide c 30 copies of your passport, one for each checkpoint. Some attempts of fraud by policemen during checks were countered without difficulty by my guide; alone it would have been more difficult. I used Ahmed Demany (ahmed_demany@yahoo.fr, telephone +22246504386 and +22222452720). It is not easy to reach him when he is traveling with customers in remote areas. He had already carried out ornithological trips, notably with Pierre-André Crochet and Thomas Lang. As a result, he knew exactly where to go to find the desired species but he can also lead you to GPS points you provide him. He is a very experienced guide who can make you visit the whole of Mauritania. A good time for this trip is end of March-early April. The temperature is still bearable and the climate is dry, the acacia trees have small green leaves that are good food for birds and insects. Personally, I chose my dates because Ahmed was available at this time. A full trip takes at least 10 days because the drives are long and slow. From Nouakchott, we went to the north by the main road N2 towards Nouadhibou and then half-way from Nouadhibou by a very sandy final track for 50 km at the small fishing port of Iwik overlooking the National Park of Banc d’Arguin, a series of islands used by wintering birds from Eurasia (cf Isenmann 2007, Isenmann et al 2010). It is possible to see one of the islands from the shore but the birds are too far away for decent observation. It is better but more expensive to rent a sailboat with a sailor. The numerous White-breasted Cormorant is the easiest to identify with the top of the breast very white. 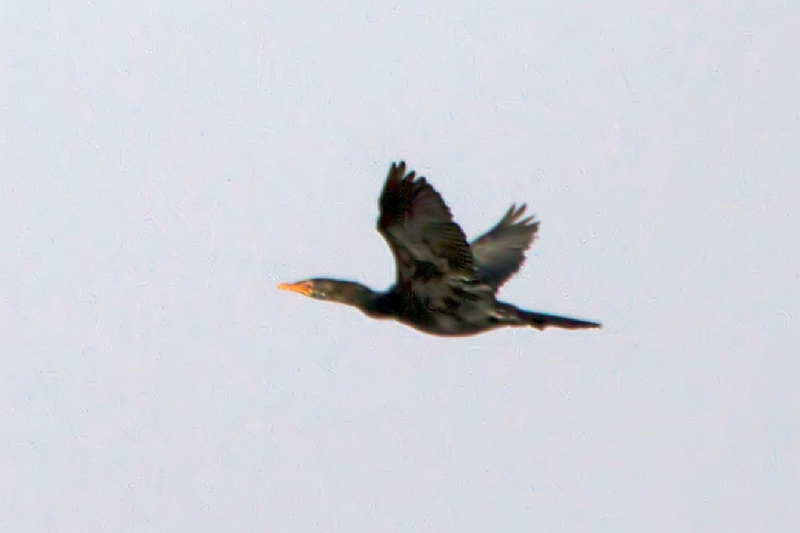 Reed Cormorants, much less numerous, are quite difficult to find from a distance apart when in flight, especially in the late afternoon when they return from the sea. Other observed species include Greater Flamingo Phoenicopterus roseus, Great White Pelican Pelecanus onocotalus, Mediterranean Gull Larus melanocephalus, Lesser Black-backed Gull L fuscus graellsii/intermedius, Caspian Tern Hydroprogne caspia, African Royal Tern and many Eurasian wintering waders. To my regret, I could not find the very rare Cape Gull L dominicanus vetula. It was a bit late in the year: many migrants had already resumed their flight to the north. 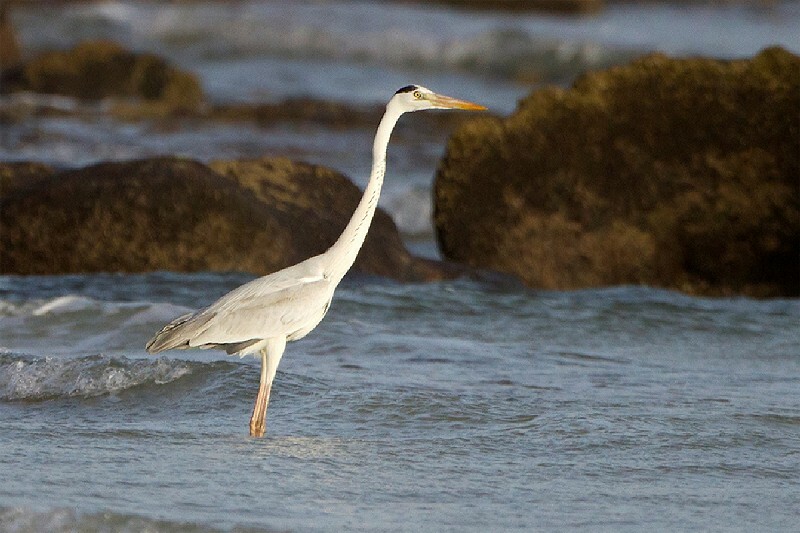 I observed a dark morph Western Reef Heron Egretta gularis gularis and some Mauritanian Herons, a species found in the WP almost only at Banc d’Arguin. Arriving at 12:00, we rushed into Nouadhibou’s gardens near the border with Western Sahara: a quick search did not produce the Abyssinian Roller. After a meal, we went back to search the bird where it had been seen recently by locals. We found the roller (20°55’43”N, 17°03’03”W), which was not really shy and I took some photographs. We did not go to Cap Blanc (southern tip of the peninsula) but Mediterranean Monk Seals Monachus monachus are sometime seen there. Ahmed had to find food and left me a few hours at Baie de l’Etoile, a few kilometers from Nouadhibou where I observed several shorebirds, herons and Western Ospreys Pandion haliaetus. After that we stopped at the Nouadhibou’s cattle market to search a Pied Crow Corvus albus seen a few days before, without success (cf Dutch Birding 40: 192, plate 252, 2018). 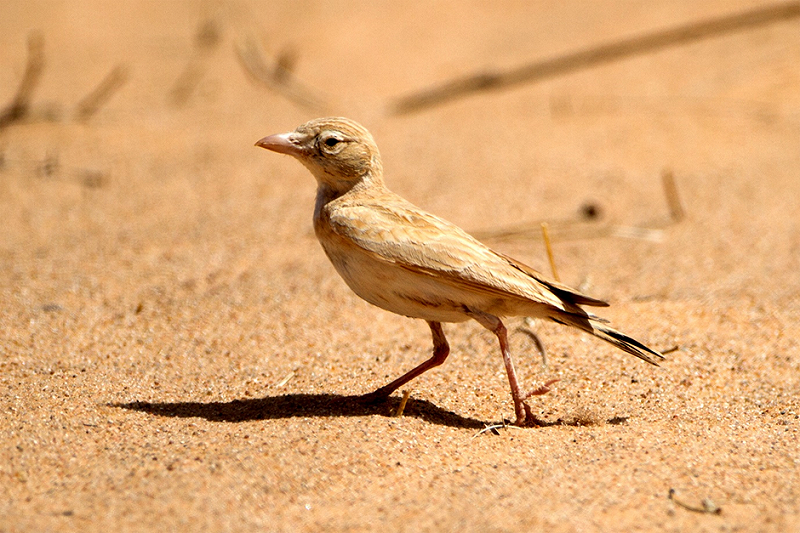 Further on, I missed an opportunity to find Sudan Golden Sparrow in the WP because I did not know at the time that it was possible to find it at Boû Lanouâr (near a goat farm). After kilometers of driving in sand dunes, we arrived at nightfall in the town of Tmeïmîchât to spend the night at the local gendarmerie. 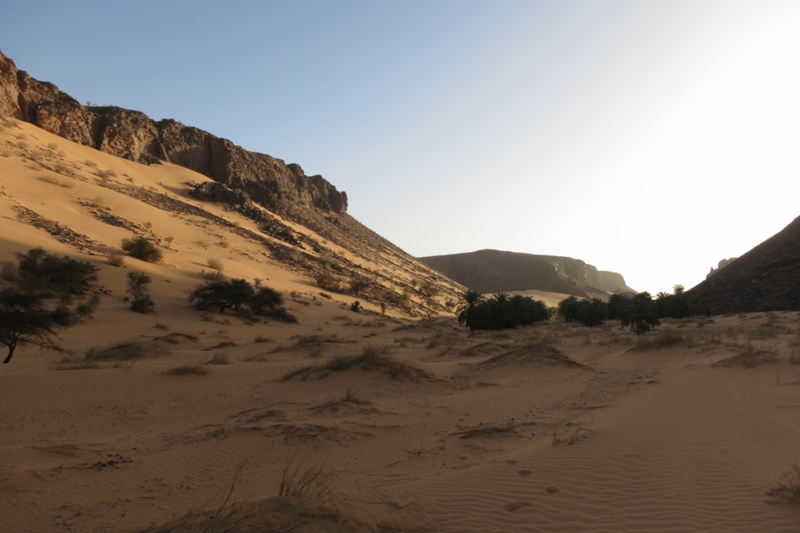 On the morning of 23 March, while still driving to Choûm, we crossed a lot of dunes and decided to go directly to Toujounine oasis (between 7 and 21 km south of Choûm) without going to Choûm; we are in the huge Adrar area. At point 1 (21°06’10.9’’N, 13°04’7.4’’W), 7 km south of Choûm, I explored among the acacia trees for a few kilometers; no Sudan Golden Sparrows were found but I found Bar-tailed Lark Ammomanes cinctura, African Dunn’s Lark, Desert Sparrow P simplex and Cricket Warbler. Then we decided to go to 20 km south of Choûm to point 2 (21°13’27.2’’N, 13°05’22.9’’W) at the end of Toujounine oasis for the night and to search Blue-naped Mousebird found by other birders on previous dates. On the way, we had a nice view of Lichtenstein’s Sandgrouse Pterocles lichtensteinii. In the evening, we had time to visit the end of the oasis at sunset: we saw Rock Hyrax Procavia capensis eating dates in the date trees and fleeing in the rocks. On the morning of 24 March, I again explored the end of the oasis to find only Western Olivaceous Warbler Iduna opaca. Then Ahmed and I explored the opposite direction where a Blue-naped Mousebird had been seen by TL some days before but without success. A bit discouraged, we went to Choûm for food and fuel. 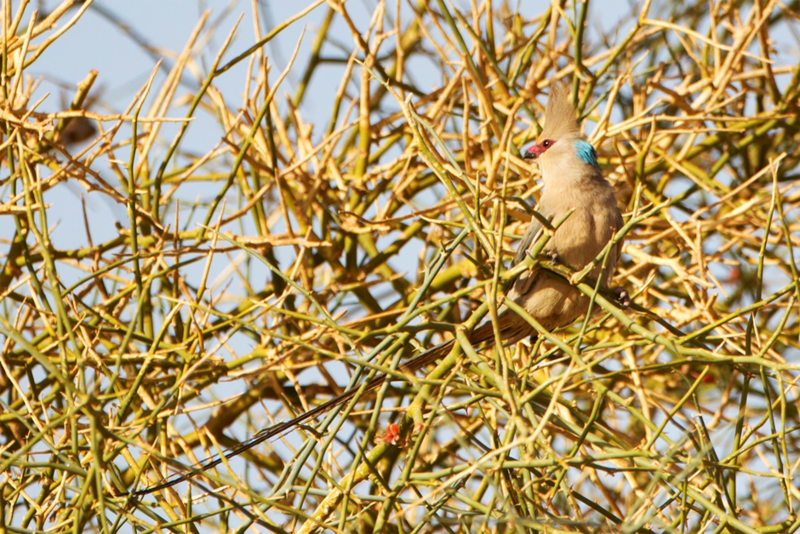 Again, we returned to the oasis and, just out of the Choûm-Atar road towards point 1, we found two Blue-naped Mousebirds (21°09’24’’N, 13°07’37’’W). They were not shy, so we managed to drive close with the pick-up and I took some photographs (plate 010). We decided to go next to Ouadâne via Atar, both outside the WP, but 15 km north-east of Ouadâne, is inside the WP. There, we hoped for African Grey Woodpecker and Golden Nightjar discovered by other birders before. After refuelling at Atar, a town that we did not take time to visit, and a night 20 km north of Atar in the middle of the desert, on 25 March we left for Ouadâne, which we reached in the afternoon after an endless journey through Ouadâne plateau. Ouadâne is an oasis just outside the WP. After going 15 km to the north-east, we arrived at point 3 (21°00’24.5’’N, 11°29’52.9’’W) where first Eric Didner and later PAC and TL saw African Grey Woodpecker and Golden Nightjar (cf Dutch Birding 38: 247, plate 373, 2016, 39: 209­210, 2017). I began to prospect on a circle of 1 km radius around point 3 but without any result. Around 20:00, I played the song of Golden Nightjar but there was no reply. At c 22:00, we heard the song far away. We headed in this direction playing the song: the bird came closer and perhaps there were several birds. At the end, we saw the eyes of one of the birds shining in the light of our torch while it sang. We were no further than 500 m from point 3 at the last observation, well within the WP. Less than a month later, a female incubating a single egg was found near, which constituted the first breeding proven for the WP ‘sensu BWP’ (Swann et al in print). On the morning of 26 March, I explored again on a circle 1 km radius around point 3. Apart from Bar-tailed Lark, I found nothing. Back at point 3, after meeting nomads, we decided to go to the two wells they indicated to us in the hope of finding Sudan Golden Sparrows drinking. At the first well, with a water basin of just 1 m diameter, there were too many goats and nomads. We left for the second well, some kilometers away. 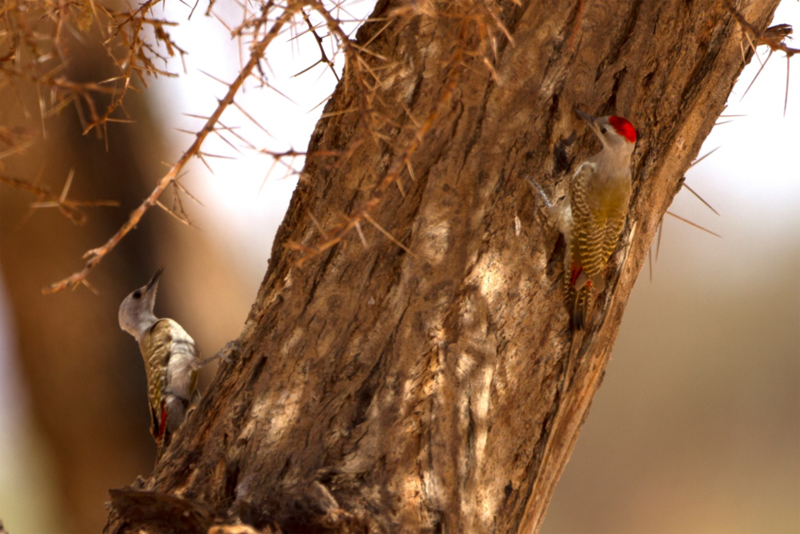 On the way in the soft sand dunes, we observed a bird sitting on a branch of a small acacia tree but it flew off at our approach: it was clearly a woodpecker. To follow it, we had to drive through a 3 m high sand dune; we had to drive around it to finally reach its top, a small plateau circled by rather small acacia trees (unlike the very big acacias surrounding point 3). The area seemed favorable and I decided to play the song of African Grey Woodpecker. As soon as I did, they appeared (21°00’35.9’’N, 11°27’19.5’’W) from all over and started flying from one tree to another. While Ahmed held the smartphone, I took a lot of photographs. We counted five birds, probably a couple and three juveniles: we had surely found a nesting place! 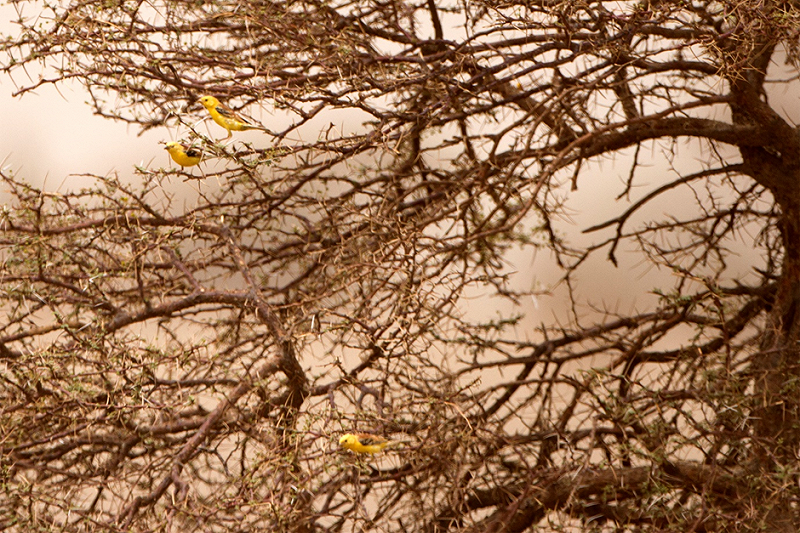 We forgot to go to the second well where we could have found Sudan Golden Sparrows. Coming back at point 3, we saw a Booted Eagle Aquila pennata perched in the top of a large acacia tree. Pressed by time, we left for El Beyyed through Guelb Er Richât, an ancient volcano formed by several concentric circles, the largest c 30 km in diameter, the result of successive eruptions. During the long drive we saw some Rock Martins Ptyonoprogne fuligula with Barn Swallows Hirundo rustica. El Beyyed is a very huge oasis where Sudan Golden Sparrows were discovered by PAC the previous year, but I preferred to go directly to Aghmakou, still within the WP. Arriving late in the evening of 26 March at Aghmakou, we stayed for the night. On the morning of 27 March, I explored the oasis but was quickly disappointed: it was too dry. Except for a few Willow Warblers Phylloscopus trochilus and Common Chiffchaffs P collybita there were few birds. 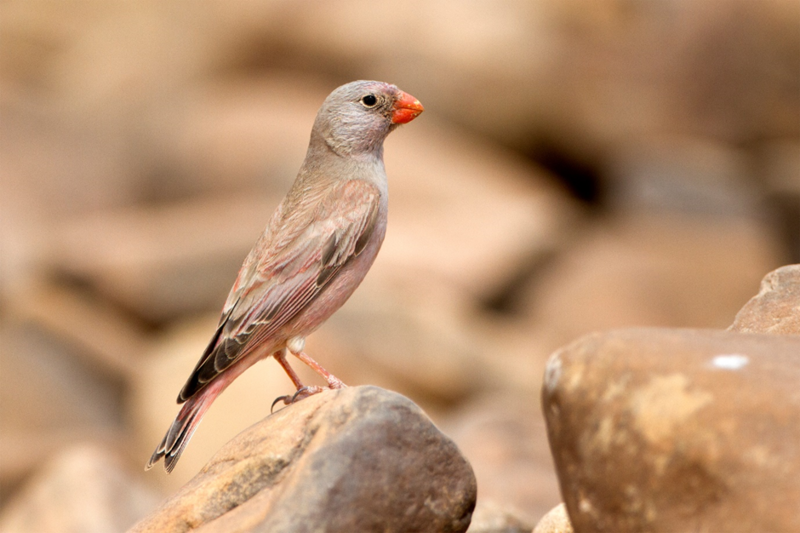 In the village, I found many House Buntings Emberiza sahari in various plumages. The gardens we followed with the pick-up were more interesting, with Laughing Dove Streptopelia senegalensis, Woodchat Shrike Lanius senator, European Bee-eater Merops apiaster, Western Bonelli’s Warbler P bonelli, Western Subalpine Warbler Sylvia inornata, Western Orphean Warbler S hortensis, White-crowned Oenanthe leucopyga, Western Black-eared O hispanica and Seebohm’s Wheatear O seebohmi, Fulvous Babbler Turdoides fulva Iberian Wagtail Motacilla cinereocapilla iberiae and Trumpeter Finch Bucanetes githagineus. In the evening, we were invited by nomads in their tent for dinner. At night, we got a violent sandstorm. Ahmed went out of his tent for an urgent need but did not not find it when coming back; he was unable to find it in the very dark night and the risk of getting lost was great; he finished the night in the pick-up without me noticing anything, sleeping very well. In the morning of 28 March, we found his tent stuck in an acacia tree at 500 m distance at least. After recovering it and seeing two Namaqua Doves Oena capensis very weakened in a small acacia tree, we left by the road Aghmakou-Atar. Along this road towards a well, we found a small group of Sudan Golden Sparrows that I photographed from a distance, unfortunately 25 km outside the WP. 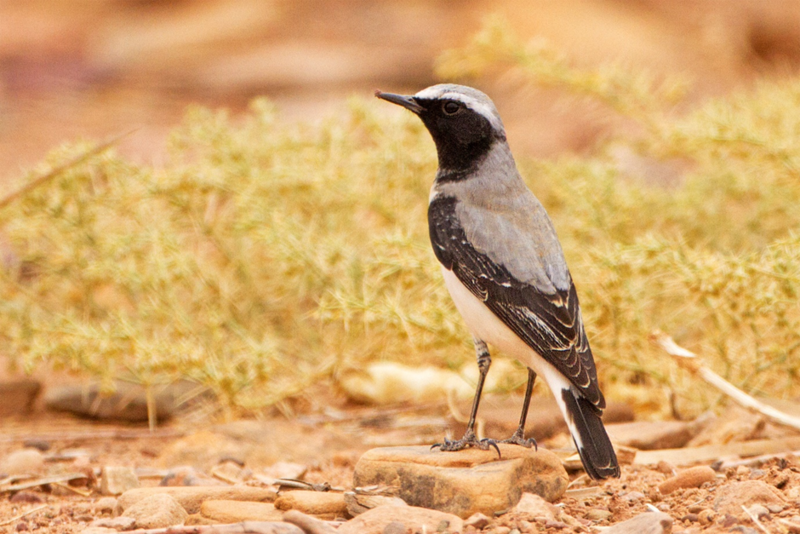 On 28 March, we had to return to Atar for a long drive and Tergit, a small town to the south of Atar, where we slept in the open air under mosquito net and where we found a Black Bush Robin Cercotrichas podobe. I had a fantastic trip in a desert atmosphere as I had never experienced before, even in Western Sahara, with superb landscapes both on the ocean side and in the desert, and finally with c 85 bird species. 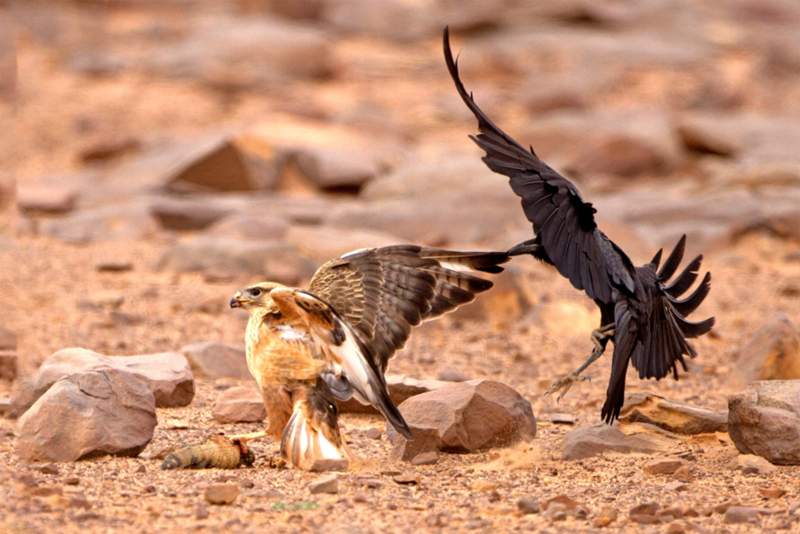 One of the best observations, apart from Abyssinian Roller, African Grey Woodpecker and Golden Nightjar, was the predation of Atlas Long-legged Buzzard Buteo rufinus cirtensis on a huge Sudan Uromastyx Uromastyx dispar on the Ouadane plateau, and then the harassment by Brown-necked Ravens C ruficollis. I thank of course Ahmed Demany who led me with mastery through this great country and helped me to find the good spots he knew based on previous trips. I thank Pierre-André Crochet and Eric Didner for their essential informations. For photographs taken by Vincent Legrand of some of the target species in spring 2018, see http://www.vincentlegrand.com/#!album-63. Crochet, P-A 2007. Western Palearctic birding in Mauritania. Birding World 20: 383-394. Crochet, P-A & Haas, M 2013. 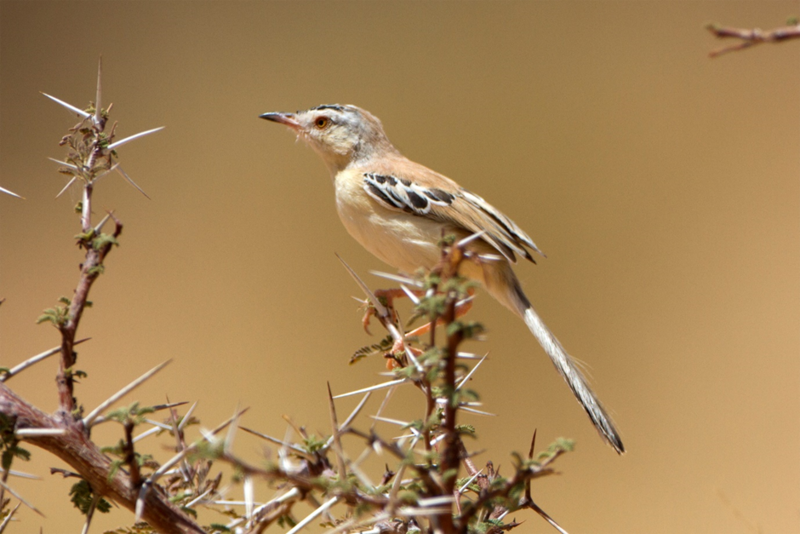 Western Palearctic list updates: re-evaluation of five species from continental Mauritania. Dutch Birding 35: 28-30. Haas, M & Ławicki, Ł 2018. Western Palearctic list updates: Abyssinian Roller. Dutch Birding 40: 104-108. Isenmann, P 2007. 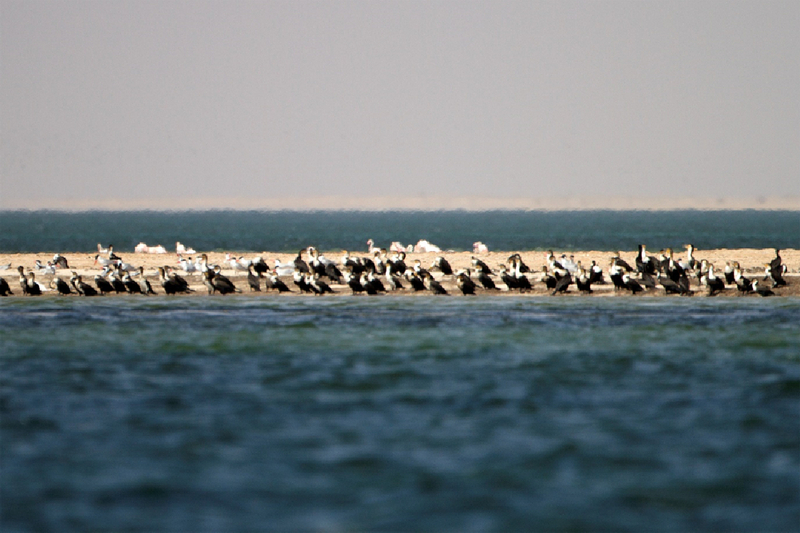 The birds of the Banc d’Arguin. Montpellier. Isenmann, P, Benmergui, M, Browne, P, Diam Ba, A, Diagana, C H, Diawara, Y & El Abidine ould Sidaty, Z 2010. Oiseaux de Mauritanie / Birds of Mauritania. Paris. Swann, R, Stronach, P, Jones, J, Pointon, D & De Rouck, K (in print). 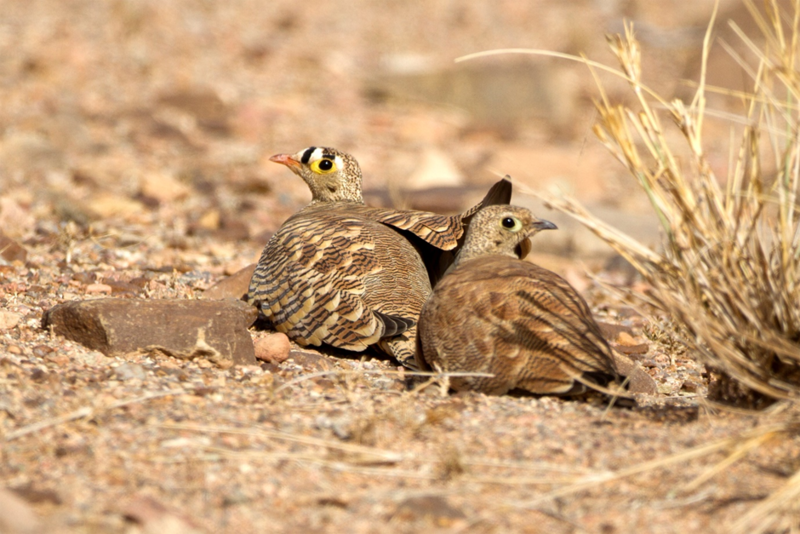 Golden Nightjar breeding near Ouadâne, Mauritania, in April 2018. Dutch Birding. Love the Ardea monica! Nice article. Some nice birds there (esp. 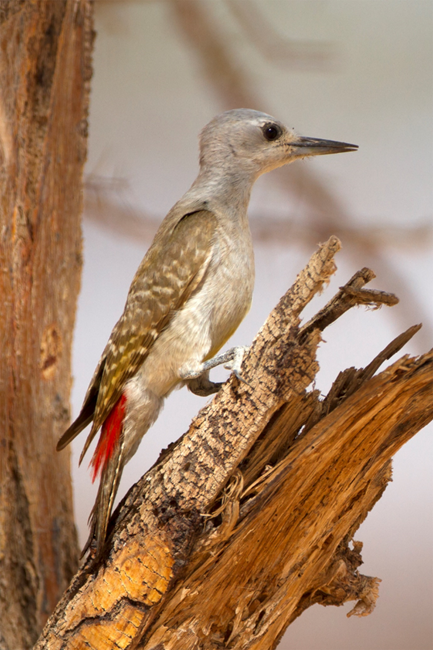 the woodpecker), even if the WP is not a concept I care about to much!